The Trevor Project filed an amicus brief today with the U.S. Court of Appeals for the Ninth Circuit to support current and prospective transgender service members who sued the federal government in response to the transgender military ban. The amicus brief provides the Court and the public with The Trevor Project’s insights into the strength and resilience of transgender individuals, but also the harms that discrimination causes. 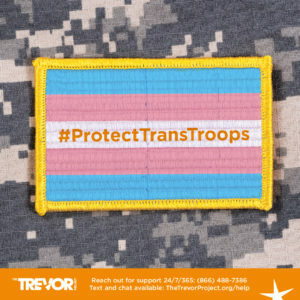 On July 26, 2017, a change to military policy was announced via Twitter that would “not accept or allow [t]ransgender individuals to serve in any capacity in the U.S. Military.” Shortly after this announcement, The Trevor Project witnessed a spike in transgender callers to TrevorLifeline, its 24/7 phone line providing crisis intervention and suicide prevention services to LGBTQ youth. The Court will now decide whether to affirm the injunction of the transgender military ban. The Trevor Project previously filed amicus briefs in opposition to the military ban in the district courts, and every district court has enjoined the ban, citing The Trevor Project in their decisions. Now, the Ninth Circuit has the opportunity to affirm the injunction of this discriminatory policy and to tell this Administration that discrimination must be stopped. The Trevor Project was represented by pro bono counsel from Gibson Dunn, including Stuart Delery, Douglas Dreier, and Charlotte Lawson.